Our Products >> Open Minds, Open Hearts - A Journey With The Ages. 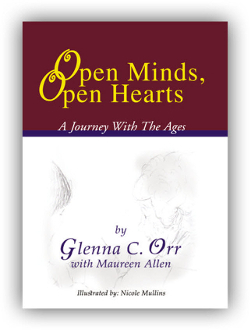 Open Minds, Open Hearts - A Journey With The Ages is a collection of memories about events in time when Intergenerational Programs were created to bring together two distinct groups of people at very different stages of life: those who were just beginning their journey and those who had a lifetime of experiences to share. Open Minds, Open Hearts - A Journey With The Ages.